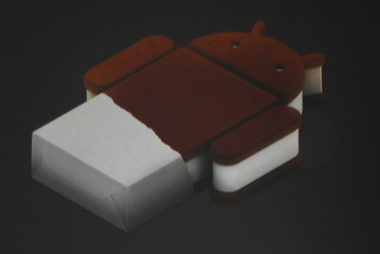 Google confirmed Tuesday that the next smartphone version of Android is called Ice Cream Sandwich and is targeted for launch in the final quarter of 2011. We broke the news in February that smartphones will indeed gain Honeycomb tablet features, and at the Google I/O developer event Tuesday, the company shared a few details of the forthcoming upgrade. Although it’s likely that Ice Cream Sandwich will bring additional features not announced today, Google is trying to unify its tablet platform with that of Android smartphones. The plan is to have “one OS that runs everywhere,” even on devices that have different screen sizes and form factors. To that end, developers will have an advanced app framework and new APIs to help scale their apps across form factors. One example shown off today was the new Music application. The same app download from the Market works on both handsets and tablets, and the application will dynamically adjust views for smaller screens: a list view of albums instead of a carousel, for example. Google is also addressing the valid concern many Android handset owners have in terms of operating system updates. Only a small percentage of Android phones are running the most recent version, which is Android 2.3.4. Google is partnering with handset makers and carriers to create update guidelines. Partners include Verizon(s vz), HTC, Samsung, Sprint (s s), Sony Ericsson (s sne) (s eric), LG, Motorola (s mmi), AT&T(s t) and Vodafone. New devices from all of these will get the latest Android updates for up to 18 months, provided the hardware can handle it. Google said the group will be creating additional guidelines for how quickly devices are updated after a new Android release. cant wait for this, but will it have any new features besides unifying the os for tablets and phones? Maybe a one year development cycle?